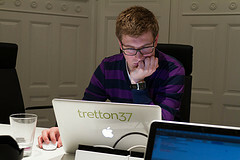 We at tretton37 like to hang out and have fun while stilling our hunger for new knowledge. So we decided to do something fun and useful one evening every week. It all started with our breakfast discussions that we call Tech Radar. This is an open forum where we discuss upcoming technologies that we want to know more about and that might be of value to our customers. Since Tech Radar is all about discussion, we created the concept of Code Night to be able to get more hands-on experience and get the opportunity to try out cool new technologies and ideas for new applications. 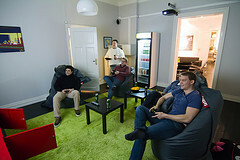 Our first two Code Nights have been all about mobile applications. Since we are .NET developers it felt natural to start experimenting with Windows Phone 7, but we have also started to explore iPhone, Android and HTML5. What have we learned from this so far? Well, apart from that is both challenging and fun to make applications to fit in the small phone display, we’ve learned that this is a relaxed and fun way to learn new technologies and share thoughts and experiences. We are now just at the beginning of the tretton37 Code Night journey, and I think that our new blog is a great way to let you know what we currently are working on, so stay tuned!